Have you been participating in the Aurifil Designer Block of the Month? Every year Pat Sloan organizes a fabulous and FREE Block of the Month from quilting industry designers! There is a theme every year and this year it is Blue and White! I am the Designer of the Month for November and my block is Geese Feet, an updated variation of the traditional Goose Tracks block! You can get the pattern for the block here. The only quilt combination that is more exciting than blue and white to me is RED and WHITE! Yesterday I was thinking about Christmas decorating ( only thinking because actually doing it is way too much work). I saw red fabrics on my cutting table from another project and had to make a Red and White version for cushions for my sofa. The BEST part about this block is you can use charms for all of the prints! 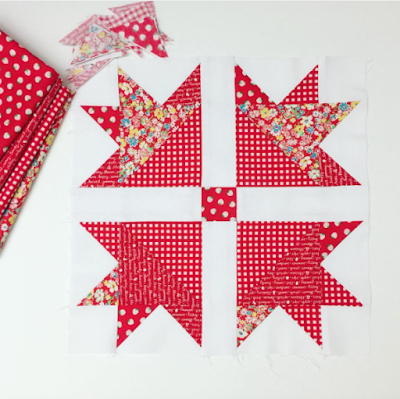 I grabbed some reds, the pattern ( did I mention the FREE part) and the white background and had a block made in no time flat! There have also been Geese Feet blocks popping up on Instagram!!!! This pretty red and white is by Elise & Emelie. And this classic blue is by Kim ( Quilty Stitches). I hope to see many more Geese Feet! 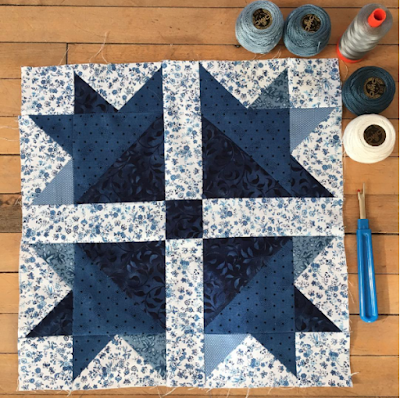 Remember that after you make the block to visit Pat Sloan's Blog and Link up your photo for Geese Feet to be automatically enter for the chance to WIN a LARGE Spool Aurifil thread collection! LINKY PARRTY HERE! I have downloaded all the blocks and plan to make them all together not sure on colour but think they are more likely to be scrappy. I love this block! I makes me want to drop everything and make it! Which I just might do....tomorrow! Thanks for sharing, Kim! I have got to make this block because I live on a lake in Northern Virginia. We have tons of geese and sometimes they make themselves a nuisance. They aren't afraid of people at all and when folks are sitting on the dock eating a snack, the geese will come right up to them looking for handouts! Yes, geese are very near to me (if not dear to my heart).